Explore your back vowels and learn to sing them clearly. You make back vowels by arching or raising the back of your tongue near the roof of your mouth, while keeping the tip of your tongue behind your bottom front teeth and keeping your lips rounded. You may be familiar with these vowel sounds (such as ooh, oh, and ah) because of how you shape your lips. Even so, you need to make sure that you keep the tip of your tongue against your teeth and keep your lips poised for action. In the table below, you can read down each column out loud to feel and hear the same vowel sounds in several words. Then you can read across the page to explore the differences. When you understand the sound and shape of each vowel, you can isolate just the sound, without the word, to move quickly from one vowel sound to the next when you sing. Jaw dropping the farthest for the vowel ah. Lips moving from rounded and slightly open for the ooh sound to relaxed and open for the ah sound. Picture five circles in a row, representing rounded lips. The circle on the left is ooh; the lips are close together, with a small, round opening. The second circle is OOh; the opening of the lips is slightly larger than with ooh. The third circle is oh; the opening is slightly larger than with OOh. The fourth circle is aw, and the opening is slightly larger than with Oh. The fifth circle is ah; it is the largest of the circles and represents the full opening of the lips. Tongue arching higher in the back of your tongue on the ooh vowel sound and arching only slightly for ah. 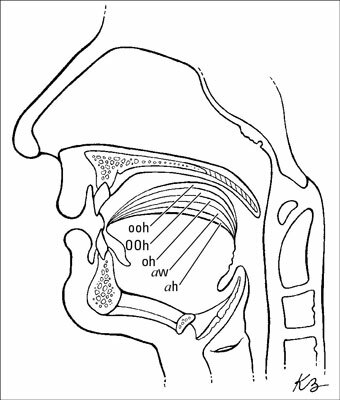 The illustration demonstrates the arch of the tongue for back vowels. The OOh and aw sounds are tricky, even if your first language is English. Practicing the ooh and OOh helps you learn to distinguish between the two sounds. OOh is similar to the sound of und in German. You also want to practice aw and ah to make a difference between these two sounds. Most of these words are pronounced differently across the United States, but the sound of the vowel in blah should be the exact same sound for the words bra and plaza. These pronunciations are for standard American dialect — how American English is supposed to be pronounced. Edith Skinner is considered the authority on standard American dialect. You can explore her book Speak with Distinction (Applause Books) for more information about standard American dialect. Singers can use their regional dialect when they sing folk music, country, and sometimes pop, but not when they sing classical music or perform musical theater. The sentences in the following list give you the chance to put all those shapes you discover in the table into action, speaking through a series of similar vowel sounds. Try to recall the shape of each vowel so you can easily differentiate among the vowel sounds when you sing. “Oops, noon hoops,” cooed Bruce. Whose pooch did Schubert smooch? The cook mistook your foot for soot. She took good sugar cookies. The bull stood in the crook of the brook. The rookie forsook pulled wool. The motel located the oasis. She saw the flaw in the law. He ought to have bought the awful saw. Fawns gnawed the raw straw. Put the calm balm on my palm. The saga at the spa was a façade. Suave drama at casa Las Vegas. Sing the pattern in the illustration below to practice shaping the back vowels. By making precise shapes with the vowel sounds, you can easily make yourself understood when you sing words. When the series of vowels becomes easy for you, look at the preceding table to find words that go with each of the vowel sounds and sing through them.